Last week we blogged about an upcoming event at Harbourfront Centre’s World Stage Festival: The Dachshund UN. Well, tonight’s the big night for little doggies, and Praxis Theatre will join the throngs of dog-lovers and UN nerds as about 36 dachshunds enact a meeting of the United Nations Commission on Human Rights. 117 dachshund and dachshund-mixes have been recruited for the effort, and you can get to know each of them here (if you can handle this much wiener dog in one sitting). Praxis will be there to live tweet the event tonight at 7pm and you can follow the hashtag #DachshundUN right here in the live stream below. I’ll try to get some good pics. If you’re on twitter, you can follow us via @praxistheatre, and via @AislinnTO and @michaelcwheeler. 36 dogs on stage. What could go wrong? 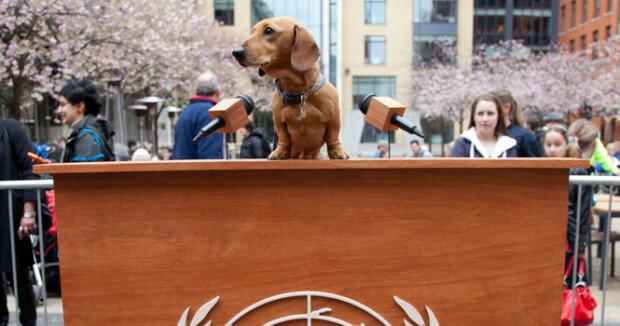 Dachshund UN continues until March 3rd.